"Gentle enough for daily use, this detox scrub lifts away micropollutants and impurities while promoting oxygenation for a fresh, healthy radiance. Doctor developed and clinically tested, this revitalizing formula contains some of the most powerful minerals and natural toxin fighters from the earth and from the sea." As mentioned, the scrub is gentle (gentle enough to be used daily) but still has enough grit that you can feel that it's done something on skin. The scrub is easily rinsed away, and leaves skin feeling cleansed, smoother, and refreshed. I like that it leaves skin feeling comfortable and isn't stripping or drying, but fully cleansed. The range/product is suited to normal and oily skin, but I tend to be dry and didn't find any issues in using this a few times a week. "Shield skin against environmental and age damage, and revitalize a dull appearance with this concentrated, mineral-rich treatment formula. Doctor developed and clinically tested, this nutrient-rich formula contains some of the most powerful minerals and natural toxin fighters from the earth and from the sea." The scrub is a great option, but the serum happens to win my heart. 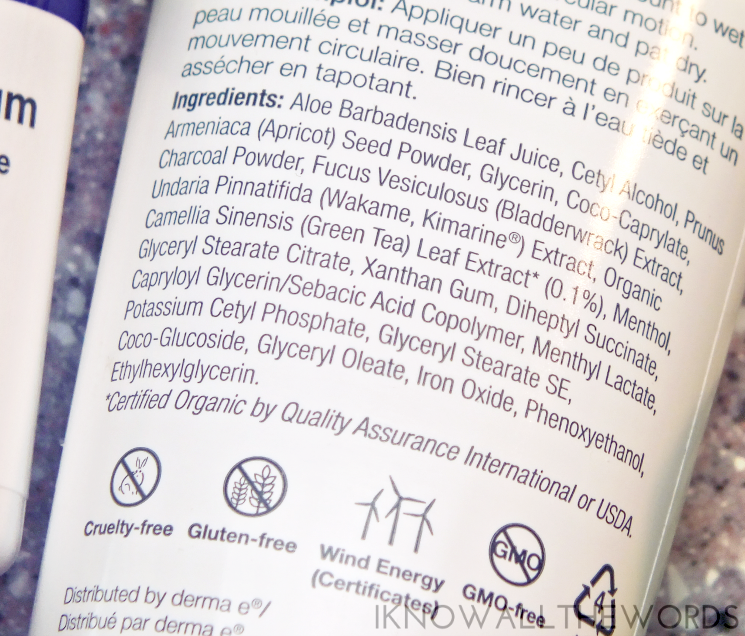 The lotion like formula utilizes many of the same ingredients as the scrub (Kimarine Wakame, Bladderwrack, and green tea which when applied topically can prevent oxidative stress and protect skin from UVA and UVB radiation damage ) to protect skin from environmental stressors and age damage. 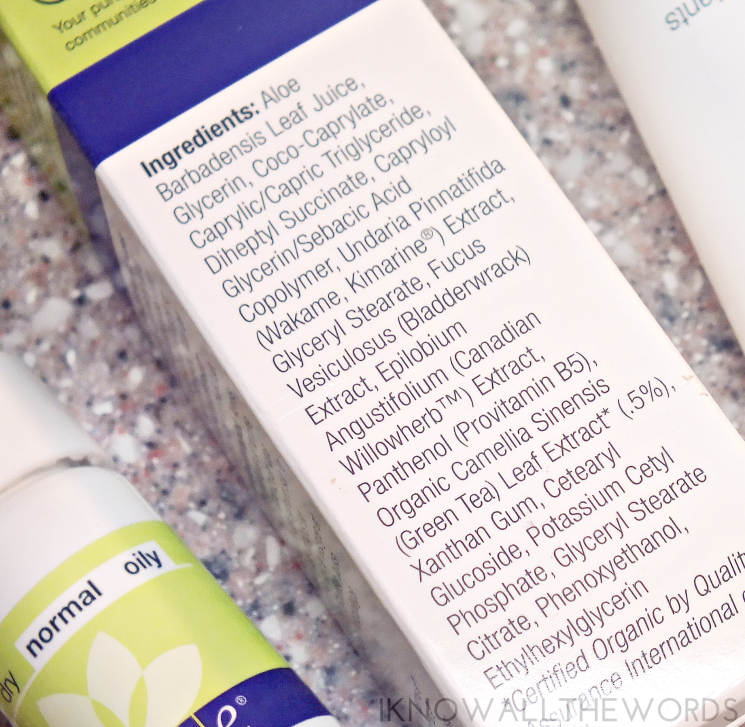 As I'm sure you know, serums are concentrated concoctions, meant to give you the best benefit from the ingredients. 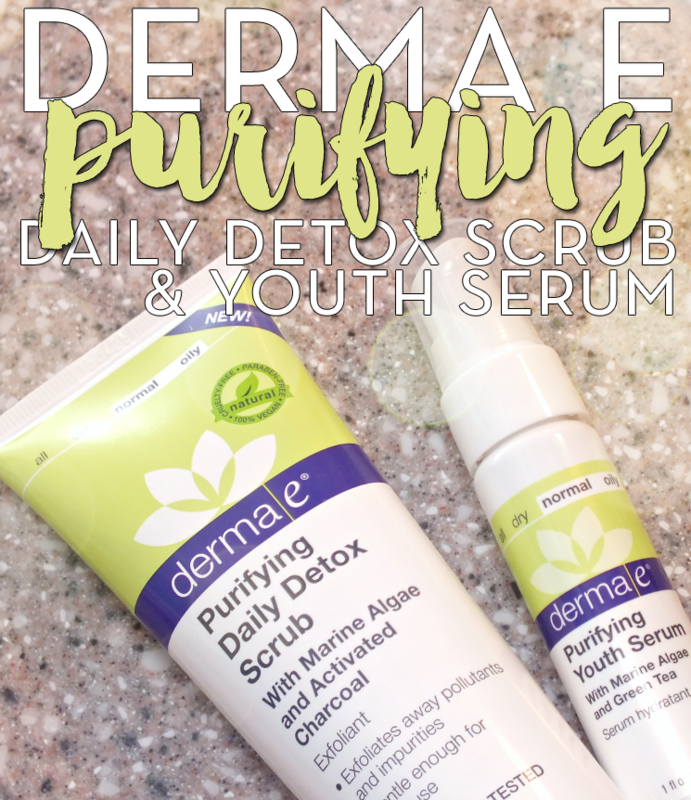 Most do contain water, but Derma e doesn't play you like that. 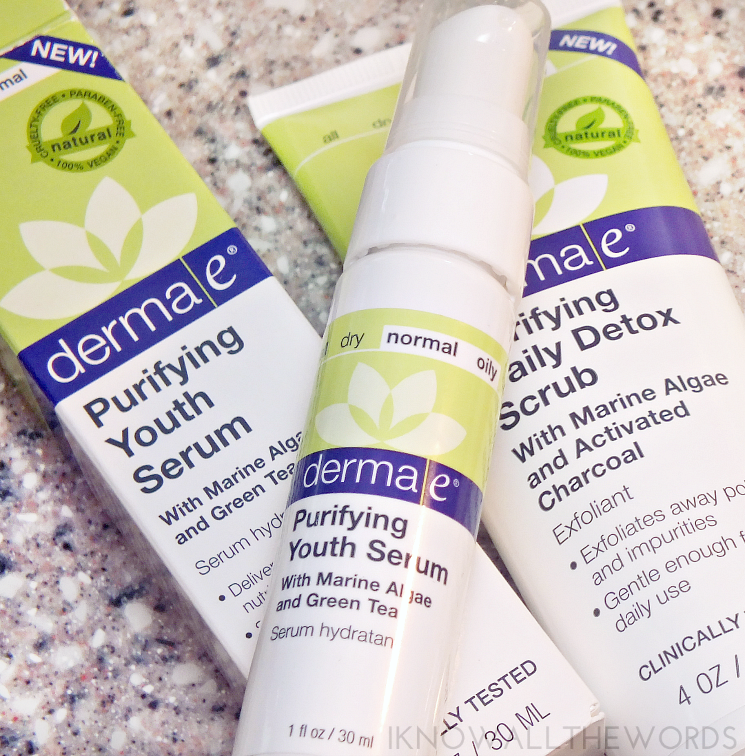 This serum boasts a water free formula that uses aloe leaf juice instead to revive skin and hydrate. The serum has a light texture that feels instantly hydrating on skin. It absorbs quite quickly for a wet formula, and does so cleanly with not residue or sticky feel. In combination with the scrub, I've found my skin to look a bit brighter (most definitely less dull) and feel smoother, and generally just better. Overall, I quite like both of these products! I feel like I will still need a more serious scrub from time to time, but love that I can use this daily and not have to worry about overdoing it. Plus, you really can't be a serum with a waterless formula. The new Purifying range also includes a gel cleanser, mask, toner, and moisturizer should you want the whole routine. Have you tried either of these products? 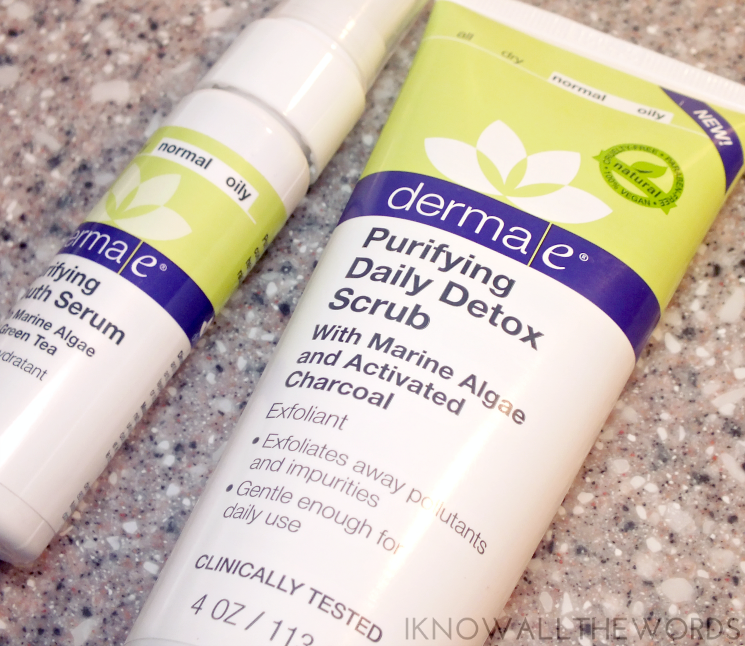 Do you have any favourites from Derma e?